The 35th National Winter Games for the Deaf (organized by the Japanese Federation of the Deaf and hosted by Toyama Deaf Welfare Association) was held for 4 days (February 26-29) in Gokurakuzaka Skiing Area in Oyama-cho, Toyama Prefecture. 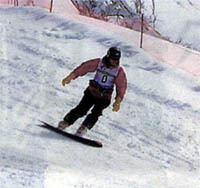 Competitions were held in three categories: Alpine Skiing, Snowboarding and Technique. 87 athletes from all over Japan (except for the 2 blocks of Chugoku and Kyushu) participated. The courses of the 2000 National Athletic Meet were made available for the games and athletes gallantly challenged the courses that require high techniques. In the Men’s Masters’ Alpine Skiing division, Ryuichi Sakaki (Akita), former Deaflymplics Alpine skier, showed outstanding performance. 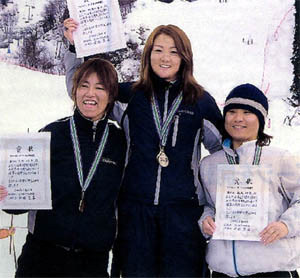 Sakaki participated in both Alpine Skiing and Snowboarding and won prizes in both. In the Men’s Snowboarding division, Satoshi Sakurai (Hokkaido) did exceedingly well by beating a former Deaflympics athlete and winning the first prize in the slalom.